The key advantage of Caeleste patented technology is said to reside in the strict usage of standard, mainstream CMOS technology, leading to lowest possible manufacturing cost. Brainvision and Stanley Electric (Tokyo, Japan) aim to serve the high volume applications such as automotive market and machine vision with Caeleste technology. Albert Theuwissen started a new series of blog posts called "How to measure ...?". The first post in the series deals with image sensor dark current measurements. Different techniques and different ways to present the results are described. ...we achieved record quarterly revenue of $276 million and we shipped over 170 million image sensors. ...On a rolling 12-month basis, I am pleased to report that OmniVision has topped the $1 billion market in total revenues. ...We believe there are many directions for strategic growth... This can lead to opportunities in the field of optic sensors, outside visible spectrum, image data processing, data interface chip, and the system solutions. ...we are leveraging the knowledge we acquired from the Kodak patent that we purchased several months ago. These patents ...greatly enhanced our ability to innovate beyond imaging sensors. ...we have a portfolio of more products based on OmniBSI-2. They will be continuously we released to the marketplace in the coming quarters. ...units sales of sensors 2-megapixel and above represented approximately 37% of total shipments, the same percentage as the prior fiscal quarter. In this category of our BSI based 5-megapixel sensor product line continued to ship at record levels in to various markets and was dominated by the smartphone segment. ...unit sales of sensors that were VGA and below represented approximately 45% of total shipments. ...our OmniBSI-2 and newer OmniBSI products are also designing with the important 30 frame-per-second feature for camera sensors today. The 30 frame-per-second feature is now narrowing the performance gap between cell phone cameras and point-and-shoot digital still cameras. This is a major technical breakthrough. The high dynamic range feature or HDR originally used in our automotive products to take pictures under extreme lighting condition is already finding its ways into smartphones ...Most OmniBSI-2 and newer OmniBSI products include this HDR capability. Our fiscal 2012 first quarter gross margin was 31.7%, 1 percentage point higher than the 30.7% that we reported in our prior quarter. ...our BSI-2 devices ...Consistent with our past experience with advance devices, we anticipate less than optimal yields during this initial rollout and this may translate into a temporary reduction in margin. ...our outlook for the second quarter of fiscal 2012, which ends on October 31, 2011. We currently expect our 2012 second fiscal quarter revenues will be in the range of $255 million to $275 million [compared to 276M this quarter - ISW] This range primarily reflects the expansion of the development cycle with our 8-megapixel product line [Apple iPhone 5 miss? - ISW] as well as cautionary part due to macroeconomic uncertainties with various companies sale already discussed in their earnings calls. ...can you give a little more clarity on the guidance here I mean typically your quarter is up, you guided now. ...could give any clarification that would be helpful. In term of the macroeconomics I think what everything that’s going on in the markets; we saw some unsettling in our numbers in front of us. So, in particular in some of the bigger segments such as the notebook and PC segments, those recent events definitely have some perturbations in the marketplace. So, we’re taking a cautionary approach when we look at that those kind of situations. And everything what’s happening in the economy globally is certainly we feel probably influencing some of the numbers. ...this extension of the development of the product cycle on the 8-megapixel, which has to do with smartphones. Could you maybe elaborate what’s going on there? Has that resulted in share loss at some of your key accounts, any details there would be helpful? Sure. ...I think the way to look at is when we launch a product, this 8-megapixel is not any different than all our other products that we attempt to launch. It’s quite intensive and extensive R&D and development. So that means, we plan on, I would say, a development lifecycle. And once we execute on that we go into mass production. So, what we see in our 8-megapixel plan is we have a plan and our plan is to hopefully hit at the tail end of this quarter as we mentioned when we can start delivering the 8-megapixel. Seeking Alpha reports that as of August 25, 5:11PM ET, Omnivision shares plunge -30% in after hours trading following the weak guidance. Sony CX-News vol. 65 announces few new imagers: 1-inch 6MP CCD providing full HD video,1/2.8-inch 1080p/30 video CMOS sensor and smartphone-oriented 1.12um BSI sensors. Industrial applications targeted ICX694 15.99mm-diagonal CCD has 6.09MP resolution and is based on 4.54um pixel. The ICX694's four outputs allow it to operate at 25fps speed at full resolution of 46fps in 1092-line cropping mode. So far diagonal 11 mm (Type 2/3) were the upper optical limit of Sony lineup of image sensors for industrial cameras. Sony used the same "EXviewHAD CCD II" pixels in 1-inch format to increase sensor's resolution while maintaining high IR sensitivity. The CCD is available in B&W and color versions. The 1.12um BSI family consists of 16.41MP/15fps IMX081PQ, 13.25MP/15fps IMX091PQ, and 8.17MP/22.5fps IMX111PQ imagers. Sony says it managed to increase the sensitivity of the new sensor, as measured per unit pixel by about 1.35 times compared to the current 1.4 µm front-illuminated sensors. The saturation signal level is increased by 1.15 times, as converted to value per unit area. All sensors in the family deliver 1080p/60fps video by addition/averaging processing of up to four pixels of the same color in vertical and horizontal direction. The interface is MIPI (SCI-2) 1,2 or 4 lanes (up to 2 lanes in 8MP sensor). The sensors integrate some image processing circuitry. Sony says: "substituting high-speed CPUs to process images for dedicated image processors is a strong ongoing trend. The IMX081PQ, IMX091PQ and IMX111PQ have a function for correcting image quality to optimum image data built into the sensor. This function easily provides high picture quality even without processing by an dedicated image processor (See figure 2):"
Market Wire: Zoran announced that its COACH 14 camera processor is available to qualified manufacturers of 3D, Full HD video, hybrid and interchangeable-lens cameras. The 1080p video sometimes suffers from video artifacts introduced by the in-sensor binning of the high-megapixel sensor data. Zoran's COACH 14 SoC is said to eliminate this problem by processing the raw sensor data to create a crisp, full resolution, full-color video stream. Supports Full HD, H.264, multi-stream compression. Digital Video Stabilization based on digital motion analysis technology that eliminates the need for a gyro, saving manufacturing costs. Motion Compensated Temporal Filter which reduces noise and improves low-light performance while eliminating blur due to object motion. Dual-sensor support for 3D still and video encoding as well as a direct connection to 3DTVs via an HDMI 1.4 port. Zoran's COACH processors power digital still and video camera models from Casio, Fujifilm, GE, Kodak, Nikon, Olympus, Pentax, Samsung, Sony, and Vivitar among others. The COACH 14 is currently available to qualified digital camera manufacturers and is being designed into multiple camera models that are planned for production in Q1 2012. "Adoption of CMOS sensors is accelerating in the digital camera market because they support faster capture speeds and higher quality 1080p video. 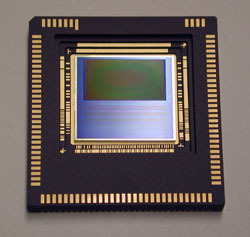 In 2013, CMOS sensors are forecast to overtake CCD sensors with 70 million CMOS sensors shipping to market versus 65 million CCD sensors," according to Tetsuo Omori, analyst at Techno Systems Research. PR Newswire: Omnivision introduced another 1.75um OmniBSI-2 pixel-based sensor - the 5MP OV5680 SoC. The 1/3.2-inch OV5680 offers 1080p/30fps full-area HD video (or 1080p/60 cropped one). The on-chip scaler enables electronic image stabilization, while maintaining full field of view in 1080p HD video mode. The sensor's 2 x 2 binning functionality with post-binning re-sampling filter enables 720p/60fps video with minimized spatial artifacts and removed image artifacts around edges. Additionally, the OV5680 can synchronize exposure and frame for stereo cameras to meet 3D video capture requirements. "With the rise of video-centric smartphones, we have experienced a steep ramp in 5-megapixel sensor demand in the past 18 months, and we are continuing to see strong growth forecasts into 2012, and reports are projecting 5-megapixel production to nearly double within the next three years as smartphones have now overtaken feature phones in the US market," commented Vinoo Margasahayam, product marketing manager at OmniVision. The OV5680 comes with a standard 2-lane MIPI interface and fits into 8.5 x 8.5 x 6 mm module. It is now available for sampling, with mass production expected for the first half of 2012. PR Newswire: Omnivision unveiled OV9770, a 1/6-inch 720p/30 HD sensor for notebooks, tablets and portable media players. The sensor is the first to be based on 1.75um OmniBSI-2 pixels and uses 300mm 65nm process. "Over 50 percent of notebooks are already equipped with HD resolution cameras. We believe the key driver for continued HD camera market growth is sensor performance. The OV9770 therefore sets a new quality standard for HD video capture in 720p by combining our strongest current low-light performance (SNR10) with our highest available sensitivity and dynamic range," says Nicholas Nam, director of product marketing at OmniVision. Compared to the first-generation OmniBSI pixel, the new pixel is said to offer a 20% improvement in peak QE, a 50% in full-well capacity, and a 20% improvement in low-light performance. The OV9770 is currently available for sampling and is expected to enter mass production in the fourth quarter of 2011. The planarisation layers 150 and 170 help to keep color filters 160 and microlens 180 flat in this embodiment. Other versions omit layer 150, so that color filter follows the PD shape. Another way to look at the lineup is here, including all sensor's flyers. Talking about the T4K05 8MP 1.12um pixel sensor, its brief spec (link fixed, thanks to comments!) says that the sensor supports "WDR function which can make images or movie with high dynamic range". The sensor is able to fit into 7.5 x 7.5mm module which is quite an achievement. The frame rate is 30fps at full resolution. The DR and SNR are not stated. The chip integrates lens shading and defect pixel correction, VCM driver, temperature sensor and two PLLs (2nd one is for MIPI output). Sensorgen.info maintains a table summarizing QE, full well and read noise for many consumer and professional cameras. It's somewhat similar to It uses the data from DxOMark, and calculates just the above three parameters across a large set of cameras by Sony, Canon, Olympus, Samsung, Pentax, Nikon and many others. Thanks to NE for sending me the link! BAE Systems Imaging Solutions - Fairchild Imaging introduces scaled-down version of its scientific CMOS (sCMOS) sensor. The new CIS1021 has 6.5um pixels in a 1920x1080 format and is based on the same 5T pixel structure previously released in the 5.5MP CIS2051 sensor, initially available to its development partners Andor and PCO. Now sCMOS sensor seems to be open to a wider range of the customers, such as Photonic Science (UK), Lavision, and others. The new sensor is said to have <1.2e readout noise, >55% QE, dark current of <10pA/sq.cm at 20C, provides greater than 88dB of intra-scenic DR and produces images at rates up to 100fps in rolling shutter mode or 50fps with global shutter, booth at full resolution. PRNU is specified at <3% RMS, full well is 30,000e-, image lag is 0.1% of maximal output, MTF at Nyquist is 0.4. 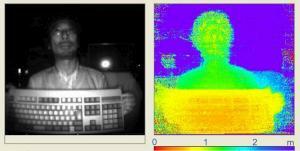 Incidentally, Laser Focus World published a comparison article on low-light imaging with ICCD, EMCCD and sCMOS sensors, written by Michael Buchin, president of Stanford Photonics. The author seems to favor sCMOS approach. The 175-pages thesis mostly contains previously published stuff covering 1/f, RTS, thermal and other noises commonly observed in pixels. Also discusses buried-channel SF design. Written under A. Theuwissen's supervision. Too written under A. Theuwissen supervision. Covers both 4T CMOS and CCD devices. Nice device physics introduction. Presented at workshop in Delft University in Dec. 2010. Talks about 32x32 SPAD imager with 25um pixels having 20.8% full factor. Invited paper from Proceedings of SPIE, 2010. Presents a very nice overview of recent works on SPAD imagers. "This 4T pixel, in a 0.18µm CMOS technology, has high fill factor and is compatible with frontside and backside illumination. The pixel has a very high charge to voltage conversion. In the present configuration we now demonstrate less than 0.5 electronsRMS read noise in the dark. We will disclose more details on this proprietary technology at upcoming scientific conferences. We invite interested groups willing to provide independent confirmation of our results to contact us. Applications are in low noise and/or low light imaging, i.e. in virtually all imaging domains." "As well as a scientific and commercial breakthrough, this could cause a technological breakthrough. We've got to the stage where we're seeing 14-16MP sensors for compacts and 20-24MP in larger sensors. It's not technological limitations that are defining that figure, it's a marketing-driven progression. When we went from VGA to 1MP to 4MP sensors, that was technology growth." "Growth in that underlying industry capacity hasn't stopped, there's just no demand for it. With 14MP, for print or web use, those are enormous images, so there's no great pressure to move on from there. But if you applied the technology being developed for mobile phone cameras and applied it to an APS-C sensor, you could in theory make a sensor with hundreds of millions of pixels - an order of magnitude beyond what we're currently seeing. With such a sensor in a light field camera, we'd be able to measure hundreds of millions of rays of light. Light field technology can utilize and re-invigorate amazing growth in density of sensors." "Light field technology is inherently more capable in low light - we can shoot wide-open with apertures larger than make any sense for conventional photography. And we're not just trying to make enormous pictures. One dead or noisy pixel in conventional photography is expected to result in one output pixel in the final image. In light field photography it translates to a dead 'ray' which won't have as much impact on the final output - the sensitivity to defects from the sensor will go down." "In our previous earnings calls, we talked about wafer foundry capacity shortage for CMOS image sensor which limited our revenue growth in this segment over the past few quarters. Starting from the second quarter, the shortage situation has been gradually alleviated and we have been able to fulfill more customer orders. We expect the capacity shortage to further loosen going forward. We also continue to make wafer level optics (WLO) and wafer level module (WLM) shipments to leading laptop and handset brands." "Our immediate challenge is to improve our overall gross margin, particularly by bringing up the gross margins of the two fastest growing non-driver product lines: CMOS image sensor and LCOS micro-display. As we reported in the previous earnings call, our CMOS image sensor, the fastest growing ondriver product line, is suffering from low margin as we are still shipping a relatively high proportion of older generation products, which will gradually be replaced by a newer generation of products with improved cost and margin. While we are confident that our margin in this segment will improve as our customers make the switch, we are seeing third quarter gross margin from our sensor product line still lower than our overall average." "We also mentioned in the previous earnings call that we faced low production yield and certain product rework charges in the second quarter when starting to ship wafer level optics to a leading handset brand for the first time. We do foresee a steady yield improvement in the third quarter." OptoIQ: Surrey Satellite Technology Ltd integrated e2v CCDs into a focal-plane array for the NigeriaSat-2 Earth observation satellite, which launched into space on August 17. Developed for the National Space Research and Development Agency (NASRDA) of Nigeria, the satellite will provide Nigeria with satellite imaging for mapping, water resources management, agricultural land use, population estimation, health hazard monitoring, and disaster mitigation and management. The e2v high-resolution focal plane for the instrument was built with an array of five CCD CCD31-40 imaging sensors. The CCD31-40 8192 × 1 pixel device has 12 µm square pixels with readout via two registers, one above and one below the image region. The registers are split in the middle and terminated in four separate output amplifiers. There are also five multispectral bands that cover the spectrum from 450 to 900 nm. The focal plane design features e2v's new packaging technique, in which the five devices are mounted in close parallel with each other and co-planar to <10 µm. "e2v is proud to deliver this innovative image sensor focal plane array to SSTL and equip NASRDA of Nigeria with valuable geographically referenced high-resolution imagery,"says Bertrand De Monte, e2v marketing and applications manager. "When looking at the large scope of the camera module makers, Nemotek exhibits the high entrepreneurial quality of a leader," said Rajender Thusu, a sensors and instruments analyst for Frost & Sullivan. "The company’s wafer-level camera solution delivers both universal and customized solutions for a highly acclaimed end user-experience for a variety of applications including mobile and smartphones, notebooks, medical and security. Nemotek now joins a prestigious list of organizations that have demonstrated leadership and cutting-edge innovation. It is a ‘company to watch’ and look forward to what Nemotek produces in the future." Nemotek announces mass production of Exiguus, a VGA WLC which integrates wafer-level optics with CMOS sensors. The Exiguus H11-A1 camera offers the thinnest form factor in Nemotek’s product portfolio, featuring 1/10 of inch. PR Newswire: Vision Research unveils Phantom v1610 camera said to be the world's fastest 1 megapixel camera, 60% faster than any other camera on the market, up to 16,000fps at full resolution. The camera features custom designed 1280 x 800 resolution CMOS sensor with 28um pixels. The sensor's I/O speed is 16 gigapixels/second. Business Wire: Rambus announced the appointment of David Stork to Rambus Labs where he’ll spearhead the development of the company’s computational sensing and imaging initiative. Dr. Stork is an expert in optics and algorithm development. His honors include being named a Fellow from the International Association for Pattern Recognition. “Dr. Stork’s expertise in optics and computational sensing, imaging and pattern recognition makes him an ideal leader for our long term research efforts in imaging systems", said Dr. Gary Bronner, vice president of Rambus Labs. Over the course of his career, Dr. Stork has held many corporate research and academic positions, resulting in 40 patents and numerous books, journal papers, invited papers and plenary talks in journals and conferences. Dr. Stork has also held faculty positions as well as visiting professor and lecturer positions at Boston University, Clark University, Stanford University and Swarthmore College. The post has been removed by ON Semi's request. The company has published prices by mistake. PR Newswire: Omnivision announces the 8MP OV8850, ikts first sensor built on a 1.1um OmniBSI-2 pixel. The 1/4-inch OV8850 is aimed to smartphone market and is said to enable autofocus modules that are 20% slimmer than any 8MP module in commercial use today. "With our new OmniBSI-2 architecture, we have further miniaturized our pixels while delivering a 20 percent improvement in peak quantum efficiency in all color channels, a 35 percent improvement in low-light sensitivity and a 45 percent increase in full-well capacity in an extremely compact and power efficient package," said Per Rosdahl, senior product manager at OmniVision. The OV8850 also features an on-chip temperature sensor, two PLLs, context switching, and alternate row exposure for HDR video and stills capture. An integrated scaler allows the camera to maintain full field of view in 1080p/30 HD video and preview modes and provides additional adjustable resolution for electronic image stabilization (EIS). The 2 x 2 binning mode provides enhanced 720p/60 HD video recording with EIS. The OV8850 fits in an 8.5 x 8.5mm autofocus camera module with a build height of 4.7 mm. Sampling will begin in August, with mass production expected in Q1 2012. PR Newswire: When talking about its R&D activities in Q2 Earnings report, UMC says: "For 65nm, UMC will benefit from the second wave of new customers targeting specialty technologies including analog, high voltage, CMOS image sensor, and embedded non-volatile memory products". It looks like university efforts to create a curved sensor (work #1, work #2) have moved into commercial phase. According to Xconomy report, Cambridge, MA-based start-up MC10 develops a sensor that is curved, like the human retina. That shape is said to be the most compact and efficient way to achieve a wide field of view with just one focusing lens. The MC10 bendy image sensor and optical system could be much smaller than existing ones, so camera phones could be made even thinner, and satellites and unmanned aerial vehicles made lighter for surveillance and reconnaissance purposes. The three-year-old MC10 has just completed $12.5M venture round B. The optical market has “billion-dollar-plus potential over time,” CEO Dave Icke said in an interview to Xconomy last month. Business Week: NASA’s Juno spacecraft to be launched on Aug. 5 to begin its five-year voyage to the planet Jupiter has 2MP Kodak CCD on board to capture images of the gas giant. The KODAK KAI-2020 CCD was selected by Malin Space Science Systems to serve as the “eye” of JunoCam, an instrument that will provide full color images of Jupiter as the spacecraft orbits the planet. "JunoCam is the eleventh time we have selected a Kodak CCD for a spaceflight imaging system," said Michael Ravine, Advanced Projects Manager, Malin Space Science Systems. "Being able to draw from the many options available in Kodak's commercial image sensor line has allowed us to tune the performance of each camera to each mission's specific needs. And our previous cameras that use Kodak sensors have logged more than 10 years of deep space operations, clearly demonstrating their reliability for space applications." KODAK CCDs will also be involved in two upcoming space missions currently scheduled to launch this November. Malin Space Science Systems selected the KODAK KAI-2020 sensor for use in four separate camera systems of the Mars Science Laboratory rover Curiosity, including the MastCam, the science imaging “workhorse” of the rover. Scheduled to arrive at Mars in August 2012, Curiosity will help assess whether the red planet was (or still is today) an environment able to support microbial life. In addition, the Russian spacecraft Phobos-Grunt will use KODAK KAI-1020 Image Sensors for navigation and landing site selection on its mission to land on the Mars moon Phobos, collect samples, and return them back to Earth. Phobos-Grunt is scheduled to land on Phobos in early 2013, arriving back on Earth in August 2014. Thanks to MD for sending me the info! Business Wire: Dongbu HiTek announced it has begun volume production of HDR CMOS sensor for BYD Microelectronics, a subsidiary of BYD, one of the biggest Chinese manufacturers of diverse products ranging from rechargeable batteries to electric automobiles. Processed at the 130nm node, BYD’s image sensors will initially target security surveillance applications, including door monitor systems. Dongbu says that it is processing specialized chips for both X-ray and Endoscope systems as well as imaging systems that can operate in harsh automotive and industrial environments. The company says it will soon be expanding its processing portfolio for VGA and 1.3-to-3.0 MP imagers with a 5.0 MP entry.